I love receiving flowers. Not only are they great 'just because", but they are great for a birthday or anniversary present too. As you all know, I have worked with Telefora several times here on The Small Things. Because in my experience, they are the best online floral shop that I have ever used. If you have never heard of Teleflora, you are in luck because I am going to share some awesome info about them! It wasn't that long ago that I received my birthday bouquet delivery from them! Another reason that I loved it was because they lasted a long time and flowers for a birthday or anniversary are a PERFECT last minute gift and flowers never disappoint! You really can't go wrong with them! Now, if you are giving flowers for a birthday snag something unique and cute! Something that the recipient will remember! After all, Birthdays come once a year! Check out some cute ideas that I found on the Teleflora website! All of my ideas are under $75 too! 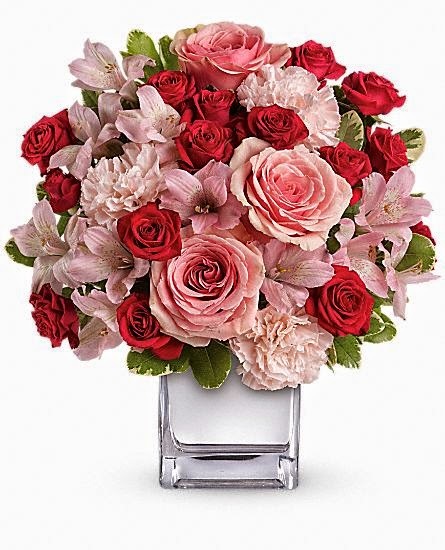 Check out Teleflora's Your Special Day Flowers! This is just adorable and it starts at only $62.95! What a cute idea for a Birthday! Don't forget about dad on his Birthday. 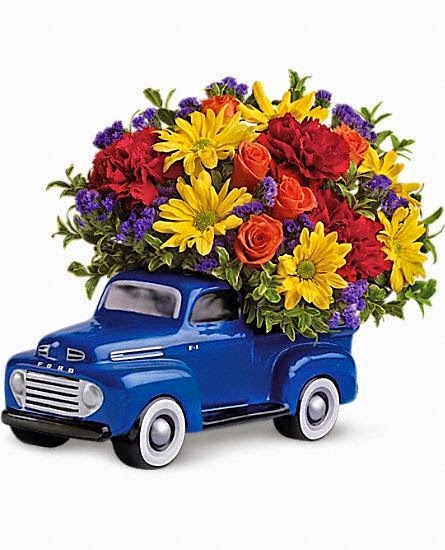 Teleflora's '48 Ford Pickup Bouquet is too cute! If he has an office, this would be something his coworkers would wow over! It starts just at $49.95! 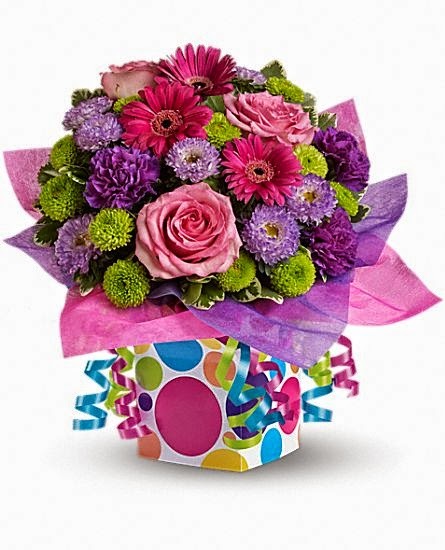 Teleflora's Confetti Present is the perfect Birthday Gift for anyone! Look at how cute that keepsake box is! You can purchase it starting at $49.95 too! Now, if you are looking for that perfect Anniversary Gift- Teleflora has some amazing options to choose from. I highly recommend using them to shop for Anniversary Flowers. Check out some of my top picks below! I love red roses but I love pink too. That is why I think that Teleflora's Love That Pink Bouquet with Roses would make a great anniversary idea! You can score them starting at $54.95 too! 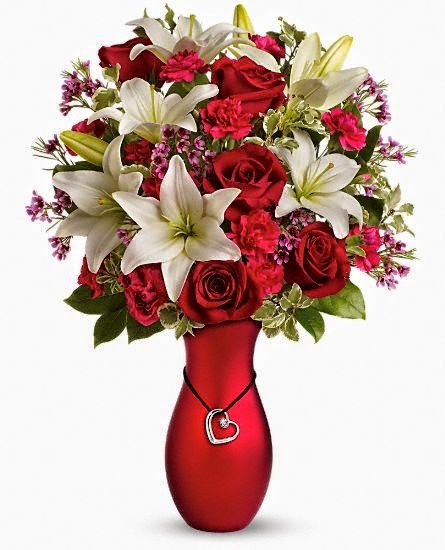 Heartstrings Bouquet by Teleflora is a great 3-in 1 gift! It comes with a red ceramic vase is accompanied by a beautiful necklace featuring a silver-plated heart pendant with a 1-carat-sized SWAROVSKI® ELEMENTS crystal on a black cord, part of Teleflora's celebrated Flowers-in-a-Gift collection. The perfect 3-in-1 gift bouquet, vase and necklace! You can get this starting at $69.95! Is this not gorgeous?! Of course, you can never go wrong with the traditional red roses bouquet. After all, the red rose stands for love right? 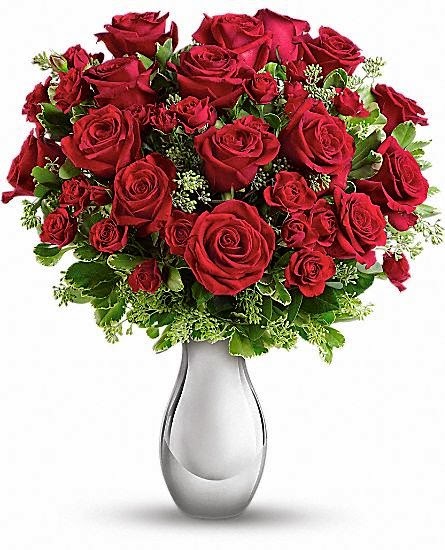 Teleflora's True Romance Bouquet with Red Roses is beautiful! You can buy it starting at $62.95 and it comes with this shimmering, teardrop-shaped ceramic vase. I hope after reading my post, you can see why Teleflora is a great place to shop for your Anniversary and Birthday gifts. Check out Teleflora via one of the links here and see what other beautiful and unique bouquets they have to offer. You won't regret it. Their flowers are hand delivered to your door with no worries! Everything they have to offer is just beautiful! You can also use the Teleflora coupon JULYUN and get 20% off of your order! Enter the promo code at check out. It expires 10/16/14 or you can click the link above and your discount will be automatically applied. Visit Telefora on their social media below to stay up to date with the latest! 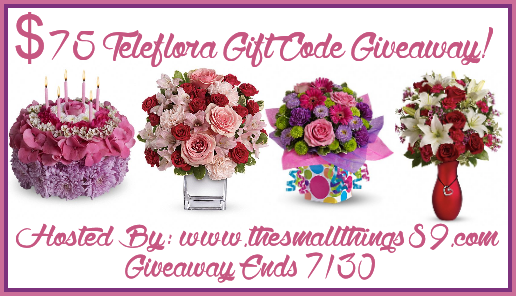 One reader is going to win a $75 Teleflora GC here at The Small Things! This giveaway will run until 7/30/14 at 11:59 PM CST. If you purchase a more expensive bouquet, you will just have to pay the difference. AND the service fee is waved with this code! Winner will have 24 hours to email me back to claim their prize. Open to the USA only. No purchase necessary to enter. Completing all entries will increase your odds. No purchase necessary. Please note this gift code is a ONE time use! I will be emailing the winner their prize myself upon claiming! Goodluck and enter below! I would choose the Teleflora's Blushing Lilies for mom. I like to receive flowers from Teleflora anytime, especially at times that are special to me. I would plan to purchase the Sweet Liberty flower arrangement. Its gorgeous! I love to receive Teleflora flowers for my Birthday, or, really, any day. Flowers are so pretty. I would get the Sweet Surrender Bouquet. I love the Teleflora's Turn Up The Pink Bouquet! Getting flowers delivered is always a very special thing for me, no matter the occasion. It's a wonderful thing! I might go for a fresh plant or one of their food baskets, like the Luxurious Indulgence chocolate basket! I have never received flowers for any occasion. The How Sweet It Is arrangement is LOVELY! I also really like the Teleflora's Ducky Delight - Boy for my nephew. Yes I like receiving flowers! I like the Beautiful in Blue bouquet. I love getting flowers! Love the How Sweet It Is bouquet! Love the Pretty in Peony arrangement! There are so many pretty ones! I think I would go with the Telefora Fancy Free bouquet! Teleflora's selection of Flower Bouquets are excellent. I really like the Sweet Surrender Bouquet. I like the Beautiful in Blue. Wow, it's been a long time since I got flowers! but, yes I do like getting them! If I won the giveaway I would get the happy Hydrangea in pink. I love plant gifts that can then be planted outside. I like to receive flowers for my birthday. 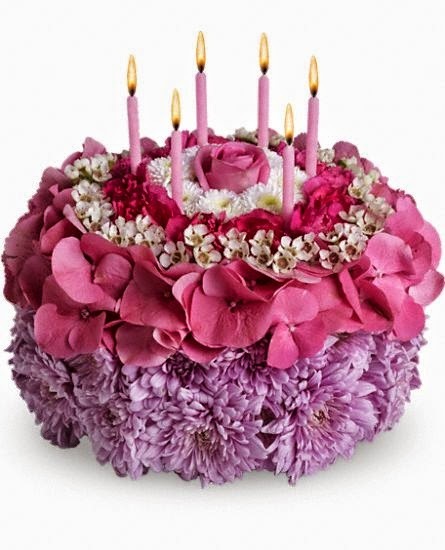 I would get the Teleflora's Rosy Birthday Present for my sister-in-law since her birthday is July 31st! My husband doesn't like to give flowers but I do like to receive them. I would buy Upsy Daisy and How Sweet it is for myself. I want to buy the Sweet Liberty Flower Arrangment! I really love the Teleflora's Hold Me Close Bouquet! I like to get flowers for my birthday. I like getting flowers for my birthday! I like the true romance bouquet. I love getting flowers for my birthday. I think the How Sweet It Is would be a perfect gift for my mom. The Zen Artistry arrangement is unique and beautiful. I enjoy flowers on my Birthday. I would buy Wondrous Wishes. I like the Cotton Candy bouquet. Parisian pinks with roses - Love it! I also like the Teleflora's Brilliant Birthday Blooms.